Race Review: Tampines Run @ North East 2014 (by 'sinaistrider') | JustRunLah! Another early alarm call, for another Sunday Race. This time I’m off to Bedok, for the Tampines Run 10k. I live west and work in the CBD, so I don’t often run in the East, but I know of Bedok Reservoir from taking my daughter to a birthday party at the climbing/zip wire place there – based on what I saw that time, I was pretty sure it would be a good place to race. It reminds me a lot of a lake run I used to do back in the UK, similar sized piece of water. Generally I like running alongside water and this course didn’t disappoint. I think maybe the organisers could highlight somewhere on the race website that the first few km’s is on a dirt track, but otherwise I have no complaints about the organisation or pre race arrangements. So after a quick trek down the PIE (through some light rain) I arrived at Bedok around 0630. I met up with the F1 Runners team for the usual warm up routine and a quick catch up on Army Half Marathon stories with a few people that I didn’t see after the race last weekend. Another big turn out of F1 runners, must have been about 40 in all. Ben : What time are you aiming for? Me: I’d be delighted with sub 40 today. Ben : Me too – ok, done. Then we spotted Tony, who is usually ultra steady with his pace and normally runs around 38-39 mins. So, tag along behind him, then hold on as best we can. Only today, Tony heads out quick ! I hit 2k in 7mins 30 – oops. That’s a bit rapid for me, so I know I am going to pay the price later on. I went through 5k in around 19:30, mostly a result of the first two quick clicks. From this point onwards I was just trying my best to dig in and not loose too much time. As each kilometre passed I was slowing, but not blowing up, so I pushed on. Into the last kilometre with 36 mins and a few seconds on the clock, means I have to run a sub 4 min kilometre to hit my target time. Despite a sprint finish, I didn’t quite make it, finishing in 40mins 16 seconds. Lesson Learnt – Don’t rely too heavily on one pacing guide. In this case, my pacing guide was Tony, and Tony decided to race faster than I thought he would. Normally I would have my GPS watch so I could have checked the pace a little earlier, but it ran out of batteries this morning, hence I only had a normal stopwatch and didnt check my pace until 2k, when it was a bit too late. So I moved through the finish areas a bit deflated and annoyed with myself, BUT then someone reminded me that there were cash prizes for the Top Ten in each category and I remember this race has a Veteran Cat. Quick walk over to the organiser and I find out I’m 8th Male Veteran. Yay $50 for me. Waited around for the awards ceremony, there were three kenyans in the race ( I guess they were still here after AHM last weekend). The winner ran 31mins – so we were in the presence of some real quality out there. I collected my $50, bought some chocolate milk from FairPrice (recovery drink of champions) and headed home. Overall this was a hit for me – similar vibe and level as the Mizuno Passion Run – I am enjoying these races that are organised by the local CSC’s. Enthusiastic volunteers, nice venues, good prizes and competitive fields. 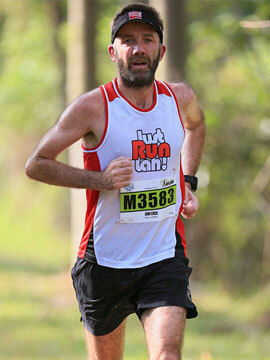 My next outing will be the ST Run 21k, looking forward to my lap of the track finish at the national stadium. One thing that needs a lot of improvement in Tampines Run 2014 is the area of providing sufficient 100plus to all runners at the finish pt. On that day (7 Sep 14), I reached the finish pt at 8.50am. I only received 1 water bottle and banana. When i asked the uncle who wore light blue tee why they do not give 100plus, he replied in hokkein: Bo Liao (means no more). When the Minister of State handed me the medal, i complained to him about lack of 100plus at finish pt. He is my witness. I checked with the organiser. They claim that they hv catered sufficient 100plus so that every runner wil get each bottle of 100plus. But the truth is: from 8.50am onwards at the finish pt, there is no more 100plus to b given to runners. strange thing is, when I finished there wasn’t any 100plus either! so somehow, they managed to not have any 100plus for the first finishers, then run out by 0850 ! 2K … 7 mins!!! just reading already had me panting hahaha! A fantastic run, sub 41 @ @ ! maybe in my next lifetime ! great review … how many strong is the F1 Club’s active members ? u mentioned >/= 40 turned up … big number indeed! 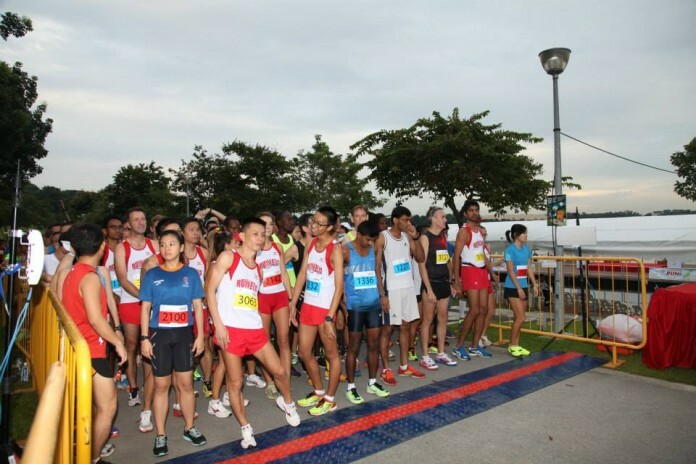 1) About the dirt track, I guess the organiser figured that most people would be familiar withe Bedok Reservoir Park track. So they were probably thinking not many 1st time runner will be present for the race. 2) About you being annoyed at yourself for missing your target by 16s, it reminds me that regardless of our individual pace, we have our own individual target. And even those who run sub 40 10K struggled with their own shortcomings, which was really strange. See u at the race! that is one (common) place i have yet to set foot on … let alone run ! been wanting to do a run thru … but haven’t gotten around to doing it ! 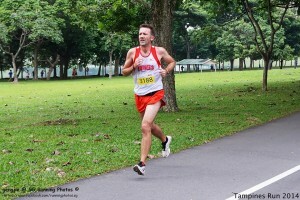 come to think of it … has there been any running events held at Pandan Reservoir before (@ Lonewolf … the stats & info guru) ? I can’t ever find out where to access pandan reservoir – is there a path around it? I can get close from the ulu pandan park connector, but when it gets to west coast road the path stops and you cant get to the water’s edge. Is there another way to get there? There appears to be a segment round it on strava so it must be accessible. I was planning to investigate although not this weekend. RED line (Ulu Pandan PC) meets LIGHT PURPLE (Pandan Gardens PC) … go on up that bridge and cont on to the Pandan Gdn PC until u get to West Coast Rd … cross the road, and go up the (grassy) embankment! NB : you’re pretty much committed once you’re on the reservoir track. if u’re seeking public transportation … only segments : Penjuru Rd & West Coast Rd. and try not to tackle this on a really hot day cos no shade! you’re closest amenity is the complex near junction of Penjuru & WC! one full round abt 7KM! thanks jas. I have got to the end of the pandan garden pc at west coast road before, just couldnt see how to get across. I’ve give that a go – I guess there’s no lighting around the reservoir – so it’s a day time route only? hey John, congrats for the timing mate! re: Pandan reservoir, I have done it a few times, it is very easily accessible from “International Business Park”. thanks – that sounds good – I’ll look out for your post! To answer your question reawakened runner, Tony is very much a wily fox. And a fast one at that. I think he finished about a minute in front of me, so must have done 37-high or 38-low. Nice after-drizzle weather for the run. Minor quibbles: 100plus drinks at the end were warm, and for late finishers, the queue for the medal/drinks extended to even before the finish line so runners had to get past the finish line and backtrack to the queue line! But these were minor quibbles. Race was well organised and the route a little easier than last year’s given the route avoided the ‘steep’ climb near Sheng Siong supermkt.